Most of my posts are hypothetical -- these are cool products, here are what other people say about them, here are my thoughts about how I may feel about that product. Well now that I have my baby and have my baby things, I'm ready to start writing some real reviews. After much research and sleepless nights, I settled on the Baby Jogger City Mini Single Stroller. - The easy fold mechanism is quite fantastic. I like to show it off and hear all the oohs and aahs that this feature receives. - It looks pretty snazzy. We got the red and black City Mini and so it is bright and bold. It's three wheels give it an aerodynamic look. - The City Mini comes with excellent accesories, such as a rain cover, parent console, and child tray. - The sun canopy is perfect. It is multi-sectioned so can cover just the top of baby's head or extend even further down to totally block baby from the sun and elements. 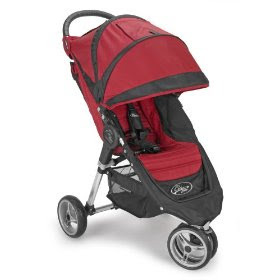 - It is lighter than most strollers of its size. - Very easy one-hand maneuverability. - It is the perfect height -- for me, that is. - It is a little short for Menachem. If the baby is sitting upright or we have the carseat snapped into it, then he's ok. But if the baby's seat is reclined, then Menachem's knees hit the stroller. Or if there are bags hanging from the Mommy Hook, then they get in the way of his knees as well. To walk comfortably, he needs to push with one hand and walk beside the stroller. We may get handlebar extenders to help make him more comfortable. - The basket under the seat is TINY and hard to access. I can barely fit the diaper bag under there. - I'm not sure if it's the three wheels or the depth of the stroller, but it is very difficult to bump this stroller up steps...and Jerusalem has a lot of steps. And so stairs need to be avoided, which is annoying. I've walked with other strollers up the neighborhood stairs and have had a much easier time. - It's not quite as light as I remember it. I still have not left the apartment alone because I am dreading carrying it up and down the stairs. We will buy a bike lock so we can leave it downstairs and then that problem will be avoided. And so, in the end, is the Baby Jogger City Mini as perfect a stroller as I thought it would be? ...Well...I hate to admit it...but it's not. Would the Maclaren Techno XLR have been a better choice? Maybe, but I didn't like the fact that there was no child tray. Is a bigger Baby Jogger City series stroller the answer, like a Baby Jogger City Classic or a City Elite? Their handlebars are higher but their baskets are also small, they're heavy, and they're probably hard to bump up stairs too. Should we sell our City Mini and try again to find the perfect stroller? Does the perfect stroller even exist? Or should we get the handlebar extenders and stop fussing about the basket and the stairs? The answer is probably yes and that is probably what we will do. If you are shorter than 6' and don't live around Jerusalem staircases, then this may be the perfect stroller for you. We're two years on from the whole buying the first stroller dilemma, and i've still not found "the" perfect stroller. now i'm a beginning to think there might be two or three pefect ones, to cover all possible uses...future blogging material perhaps? Interested in selling it?? If so post on imamother and I'll find it!